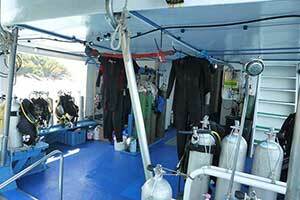 Our live-aboard, M/V SIMILAN EXPLORER has a wooden monohull. 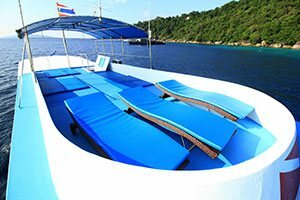 The Similan Explorer has 3 decks. 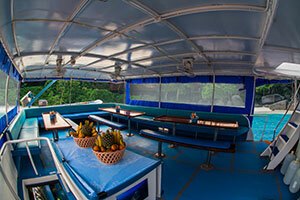 The main deck has 6 cabins for our guests. 4 Twin Berth, and 2 Four Berth cabins, these are fitted with curtains for each berth bed for your privacy. Every year during the low season the Similan Explorer is taken into dry dock for a full overhaul which includes engines, hull and generators. Our compressors, tanks and diving equipment are checked by qualified technicians before the beginning of the season. The upper deck has 2 Double bed cabins that when you open the door you will have a sea view and where you can find the wheel house (captains quarters) at the bow. At the stern is the eating area. Here you can help yourself with coffee, tea, toast, water, electrolyte drinks and fresh fruit which is always on the table for your convenience. All cabins are air-conditioned and have a sea view window that opens. All cabins have 220v plugs, so you can charge your battery packs or your lights. Our food is very popular with our guests. Every morning there is breakfast European style: we serve Brown Bread, Omelettes, Fried eggs, Sausages, Corn Flakes, Muesli, fruits, tea and fresh ground coffee or Nescafe. 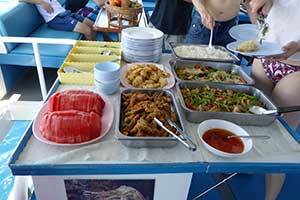 Lunch and Dinner are served with traditional Thai food. We cater for Vegetarians, just tell us your needs. The galley is on the main deck. The cook and her assistant prepare the food fresh every day. We cater for vegetarians and any other special dietary needs you require. Don't worry about the famous Thai chilies! We can cook to your taste. The dinning area consists of 1 table on the port side and 2 tables on the starboard side so there is ample room for dining, the sides of the boat are open so you can enjoy the good weather to the maximum. On the main deck at the stern is the Dive Platform and gearing up area for your diving equipment which has more than ample room to put on and store your dive gear. We also have 40 12 ltr Tanks we use INT connection, we do have DIN adapters and 15 ltr Tanks for rent. 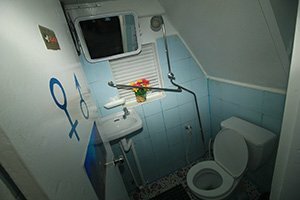 There are 3 toilets with showers and 2 showers on the dive deck. 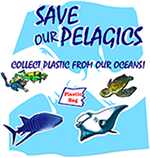 Ocean friendly bio-degradable soap and shampoo are available in our 3 toilets and shower rooms on the main deck. Lots of room here for getting your tan, sundeck chairs under our shade at the back of the sun deck. 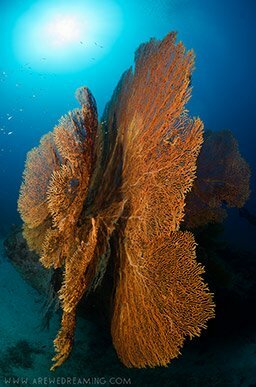 This is a nice place for spotting Dolphins, Manta rays and Whale sharks while travelling to new dive sites and up here you're always the one to spot the Dolphins first.